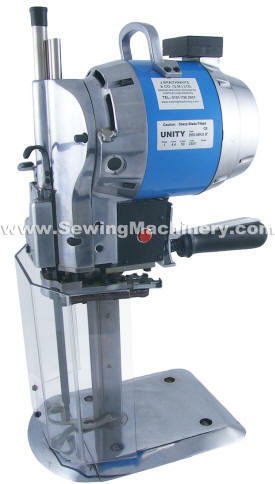 General purpose industrial straight knife cloth cutting machine for use in the clothing and textile industry. Inexpensive industry standard replacement straight knife blades. low profile base plate with smooth running rollers. Built-in oiling system with visual level gauge. To cut cloth fabric and textiles. Updated MKII model now features a more powerful industrial motor and enlarged front safety shield fitted as standard equipment. Optional auto stop "dead mans" handle kit available at extra cost (replaces on/off switch).